Whether it's cracking the throttle wide open out of an exhilarating corner, or braking hard while tipping it in, bending the laws of physics is what the KTM 1290 SUPER ADVENTURE S is made for. Its powerful engine combined with a mere 473.9 lb dry weight is kept in check by the most advanced electronics in the world of motorcycling. All you have to do is focus on the road ahead and hold on tight, while enjoying every twist and turn en route to your destination. BODYWORK & GRAPHICS: The bodywork on the KTM 1290 SUPER ADVENTURE S is not only shaped to impress, but also to give you unrivalled performance on the ride. The sporty graphics highlight the bike’s many innovative parts and features – such as the state-of-the-art display and user-friendly functions that enhance the riding experience. USB PHONE POCKET: A convenient compartment keeps your smartphone safe on the road. It keeps it charged too, thanks to its integrated USB socket. The optional incoming call and audio functions link the phone to the bike via Bluetooth. It’s always nice to let people know you absolutely have to take that enormous detour. TFT DISPLAY: The KTM 1290 SUPER ADVENTURE S gives riders all the necessary and desirable information on a state-of-the-art, clearly arranged 6.5-inch TFT display. Even in direct sunlight, vital data is displayed clearly and crisply thanks to its bonded, anti-glare surface made of a strong sheet of glass. In addition to obvious data (speed, revs, fuel level etc), the computer can show different ride modes, ambient air and oil temperature, onboard voltage, trips, average speed, fuel consumption stats, plus range and distance to next service. 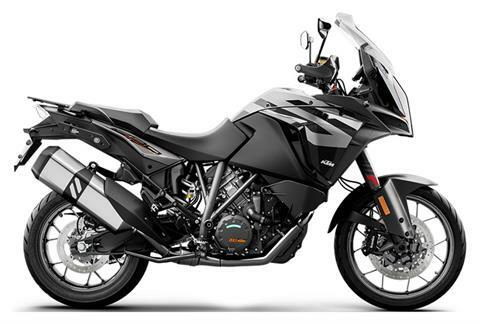 CHASSIS: With its ultra-lightweight tubular trellis frame, a high-strength, die-cast, open-lattice swingarm and top-quality WP Suspension components, the KTM 1290 SUPER ADVENTURE S offers outstanding stability and control in any situation. Keeping asphalt lovers in mind, the 1290 S is fitted with a 19-inch wheel up front and 17-inch at the rear, while excellent braking power is ensured thanks to world-renowned market leader BREMBO. FRAME: The chrome-molybdenum steel trellis frame is at the center of the bike’s excellent robust chassis. Laser-cut and robot welded with a superb surface finish, it weighs a mere 9.8 kg, keeping the total unfueled weight at an impressively low 217 kg. All muscle, no fat. SWINGARM: The die-cast, open-lattice swingarm is not only particularly light, it's also precisely manufactured. The design has been optimized for stiffness and stability while still offering excellent flex characteristics. WHEELS: Alloy rims, manufactured in a low-pressure die casting process, are featherweight, and make the bike lighter overall. They also minimize the unsprung masses and moment of inertia, with a positive impact on handling and ride dynamics. The KTM 1290 SUPER ADVENTURE S gets a set of extremely grippy and durable tubeless Pirelli Scorpion Trail II’s – sized at 120/70 ZR 19-inch and 170/60 ZR 17-inch. They are the perfect wingmen for this corner stormer. SUSPENSION: The innovative WP semi-active suspension enables the rider to select four spectrums of use: ‘Comfort’, ‘Street’, ‘Sport’ and ‘Offroad’ while the SCU (Suspension Control Unit) adapts the damping rates in real-time to the riding surface and rider, based on the information provided by a set of stroke sensors and accelerometers. In addition, the spring preload of the rear suspension can be set to four pre-defined settings (solo, solo with luggage, two-up and two-up with luggage) – providing the perfect geometry in all situations. STEERING DAMPER: With so much power at the back wheel, the front wheel can become very light when the throttle is cracked open, which can lead to unpleasant destabilization on uneven roads. The KTM 1290 SUPER ADVENTURE S prevents this with a subtle WP steering damper that’s there when you need it. BRAKES: Precise. Powerful. Consistent. Just as you would expect from a set of BREMBO brakes. Up front you’ll find twin 320 mm diameter discs, which are radially mounted, plus 4-piston fixed calipers. At the rear, excess speed is taken care of by a generously dimensioned 267 mm diameter disc. And in case of an emergency, BOSCH’s two-channel 9M+ ABS is there to save the day. FUEL TANK: The KTM 1290 SUPER ADVENTURE S is more than just light, powerful and dependable. Thanks to low fuel consumption, a 23-liter fuel tank and 15,000 km service intervals it also hardly ever needs to take a break. ENGINE & EXHAUST: There’s more than enough power at your fingertips to explore beyond your wildest imagination, thanks to the KTM 1290 SUPER ADVENTURE S’s 1301 cc V-twin engine. Immense power, total satisfaction. ENGINE: The 1301 cc V-twin engine’s 160 hp with 140 Nm of torque are equally suited to lazy street riding as they are to full-throttle blasts onroad or off. The combination of lightweight chassis engineering and a compact but powerful engine take the KTM 1290 SUPER ADVENTURE S to the top of its class in terms of power-to-weight ratio and ride dynamics. A unique mix of the highest quality components combined with a fully developed and reliable engine allows extremely long service intervals of 15,000 km. That’s a lot of adventures. TRANSMISSION: A spread transmission on the primary wheel transfers the power to the clutch basket without any backlash, which eliminates vibration and reduces engine noise. On the intake sides there is a newly developed resonator chamber, designed to polish the torque output in the lower to mid-range rpms. This substantially increases the smoothness of the KTM 1290 SUPER ADVENTURE S’s power train. POWER ASSIST SLIPPER CLUTCH: Not only does the slipper clutch open when the engine back-torque becomes too high, it also assists when you open up the throttle. The former prevents destabilizing rear wheel chatter when braking sharply or decelerating; the latter reduces the lever force required for changing gears, allowing the clutch to be controlled with one trigger happy finger – saving you energy while riding. CYLINDER HEADS: A key element in the smooth power delivery of the 75° V-twin is each cylinder’s state-of-the-art 4-valve cylinder head. These combine twin plug ignition, flow-optimized ports and a slick low-friction valve drive train with cams from each cylinder’s twin overhead camshafts driving DLC-coated cam followers. DLC COATING: DLC (Diamond-Like Carbon) is an extremely hard, durable coating used in many engine parts, such as cam followers, to assist sliding behavior. It improves performance and our engines love it! TWIN IGNITION: The twin plug ignition system controls the two differently sized spark plugs in each cylinder head independently of each other. This results in more efficient combustion and a smoother, optimally controlled combustion sequence. What that means to you, is better-controlled power, lower fuel consumption, and reduced emissions. PISTONS: The KTM 1290 SUPER ADVENTURE S’s forged piston structure is derived from Formula 1 technology. The result is a high loading capacity despite its extremely short and lightweight design. Although they have grown in diameter by three millimeters, the pistons are 47 grams lighter. This way, reciprocating weight is minimized, for responsiveness and a playful engine nature. The piston skirts have an additional state-of-the-art, GRAFAL® finish. It further reduces friction and is particularly hard wearing. CRANKSHAFT: The extremely low crankshaft reciprocating weight enhances the responsiveness and free-revving nature of the engine. With a flow-optimized crank web shape, the particularly low-loss running of the crank drive is further enhanced. OVERDRIVE: The sixth gear serves as a long overdrive in the KTM 1290 SUPER ADVENTURE S’s well-spaced gearbox. This saves fuel and adds to your cruising comfort. RIDE-BY-WIRE: Smooth throttle response is what you get, beyond simply being free of a throttle cable, which is why the KTM 1290 SUPER ADVENTURE S's ride-by-wire system is so attractive. It ensures perfect dosage of the readily available and plentiful torque, while electronically translating rider throttle commands into throttle valve positions, which are perfectly adjusted to suit different riding conditions. ERGONOMICS & COMFORT: Depending on the adventure, the bike’s ergonomics can be easily adjusted to suit the rider’s style, stature and preference. This equals a more comfortable ride, and a big grin once you get off it at the end of the day. HANDLEBAR: With two handlebar clamping positions: 10 mm forwards or backwards from stock; plus five reach settings of the hand levers, the rider has more freedom to move, greater control, and uncompromised comfort, which means a more satisfying adventure ride. Illuminated switches are designed to aid quick and easy access to the many control options from a natural riding position. MENU SWITCH: Different modes for the various assistance systems can be selected using a menu switch on the left side of the handlebar. It's very simple and intuitive: "up" and "down" through the menu selection, select the desired menu item with the left button, confirm it with the right. And you can make it even easier by personalizing your settings screens with two quick-select menus. Job done. FOOTPEGS: Two footpeg positions: stock or 10 mm up and back (diagonally), allow riders to set the comfort level to suit their height and riding preference, which can make a big difference on a long adventure ride. SEATS HEIGHT: This is where you’ll hopefully spend a lot of time, so the seat has to provide support, adequate feedback and freedom of movement. Thanks to KTM’s state-of-the-art 3D foam padding, the KTM 1290 SUPER ADVENTURE S has your backside covered for those long days in the saddle. When exploring far it’s all about comfort for you and your passenger. In addition, you can choose between two seat positions (860 mm or 875 mm). ILLUMINATED MENU SWITCH: Illuminated switches don't only look good, you locate the most important buttons in the blink of an eye. At night. WINDSHIELD: The windshield’s height can be changed as quickly as you can change your mind, thanks to the easily operated self-locking winder. BODYWORK: The 1290 SUPER ADVENTURE S was shaped in ways that give you unrivaled performance, great ergonomics and many details that will keep you going even when the road ends. DASHBOARD: The KTM 1290 SUPER ADVENTURE R supplies its rider with all necessary and desirable information on a state-of-the-art, clearly arranged 6.5 in. TFT display. Even in direct sunlight, core data is displayed clear and crisp thanks to its bonded, anti-glare surface made of a strong sheet of glass. But don’t worry about spots or smears; the anti-fingerprint coating has this covered. The screen also automatically adapts to ambient light levels and its angle is adjustable, so you won’t miss one bit of information. On top of the obvious data (speed, revs, fuel level etc. ), the computer can show a favorites menu with up to 8 adjustable features, an MSC ride modes overview and a riding conditions page (outside/oil temperature, onboard voltage, various trips, average speed, average and current fuel consumption, range and the distance to your next service). Crystal clear and easy to operate, even when you’re in a hurry. MENU SWITCH: Different modes for the various rider aids can be selected using an illuminated menu switch on the left side of the handlebar. It's very simple and intuitive: "up" and "down" through the menu selection, select the desired menu item with the left button, confirm it with the right. Child’s play, basically. And you can make it even easier by personalizing your settings pages with two quick-select menus. SOFTWARE & ELECTRONICS: Controlling its immense power in all situations is simple thanks to the smoothly operating software and electronics package. MTC (KTM’s lean angle-sensitive traction control system – Motorcycle Traction Control), Cornering ABS and ride modes support your riding – and do it gently and almost imperceptibly. The only intervention you notice is your grin from ear-to-ear. MSC WITH C-ABS (COMBINED ABS) AND OFFROAD MODE: BOSCH’s MSC assistance package is the world's first lean-angle sensitive cornering ABS system. It allows riders to always use the full power of their brakes while the system adjusts brake pressure to match the lean angle of the motorcycle, for safer and more predictable braking across a wider range of conditions and scenarios. If required, not only can it be switched off, but also placed in Offroad mode. TPMS (TIRE PRESSURE MONITORING SYSTEM): As its name implies, the TPMS (Tire Pressure Monitoring System) monitors tire pressure (visible in the display) and warns the rider instantly of any pressure loss, whether sudden or gradual, whether tire damage or a valve leak. MTC (MOTORCYCLE TRACTION CONTROL): The Motorcycle Traction Control (MTC), a lean-angle sensitive traction control system, which reacts in a matter of milliseconds the instant the rear wheel spins out of control. As smooth as it is quick, the system closes the throttle valves in order to regain grip. Compelling yet completely controllable forward drive on all surfaces is guaranteed. There are four different ride modes – ‘Street’, ‘Sport’, ‘Rain’ and ‘Offroad’ – selected using the multi-functional switch on the left handlebar grip. Oh, and there’s the off-switch if your game! ATIR (AUTOMATIC TURN INDICATOR RESET): After 10 seconds of movement and 150 meters of riding distance, the turn indicator will stop automatically. When pressed again, it recounts from zero. A big improvement in terms of safety, as it is now impossible to forget to reset the indicators. OFFROAD RIDE MODE: Once this mode is engaged, the ride-by-wire limits the throttle response and peak power, putting you in full control wherever you take your bike. This allows the rider to lock the rear wheel when required – a prerequisite for committed offroad riding and deliberately executed slides. The ABS function remains active on the front wheel, even in this mode. OFFROAD TRACTION CONTROL: The Offroad TC mode allows up to 100% more slippage than regular TC – which equals double rear wheel speed – for ambitious offroad use. Turn it on and master controlled drifts with ease. OFFROAD ABS: The Offroad ABS mode allows the rider to lock the rear wheel as and when required – a prerequisite for committed offroad riding and deliberately executed slides or pivots. The ABS function remains active on the front wheel, but it intervenes later than on the street and builds up braking pressure in a different way to find grip on loose surfaces more easily. CRUISE CONTROL: The standard cruise control laughs at long motorway journeys. Switches on the left side of the handlebar and a display in the TFT dashboard allow the rider to intuitively set and change the requested speed, so you’ll arrive where the real fun begins with energy to spare. KTM RACE ON: Forget about ignition keys and mechanically locked fuel caps. All you need is the ‘keyless’ transponder in your pocket. KTM MY RIDE: With the KTM MY RIDE system, a smartphone can be connected to the bike, which gives the rider the option of receiving or making phone calls, listening to music, and, using the optional app for navigation. Chain - X-Ring 5/8 x 5/16 in.